The last weekend in June Playhouse 111 will be transformed into a cabaret venue. 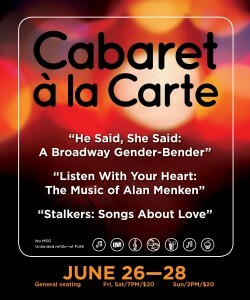 If you haven’t been to a cabaret performance, you should attend this unique art form. The performers are not only talented as vocalists, but will give you insight about the artists who wrote the songs. It will be an evening of sheer entertainment. Tickets can be purchased right here on the website or you can call 630-260-1820. There will be open seating. The ticket price for all three shows is $20.00. Friday, Saturday and Sunday, June 26, 27, 28. 7:00 curtain on Friday and Saturday and 2:00 on Sunday. “Listen With Your Heart: The Music of Alan Menken”, featuring Christine Pfenninger and David Pfenninger. There will be two short intermissions where complimentary light and elegant hors d’oeuvres will be served.